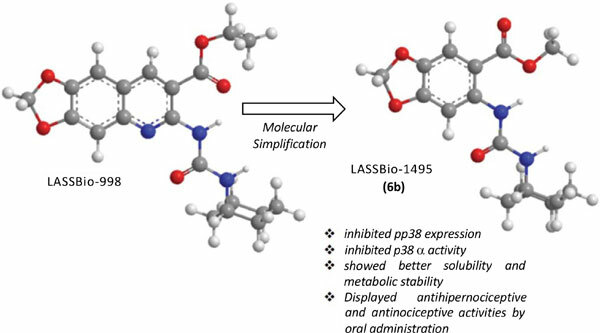 Objective: In this paper, the synthesis, plasma and microsomal stability, and in vitro and in vivo pharmacological profile of urea derivatives (6a-d) designed by molecular simplification on prototype LASSBio-998 are described. Methodology: Compounds were synthesiized exploring condensation of amine derivatives with cyclohexylisocyanate. Plasma and microsomal stabilities were analyzed by HPLC. Chemical stability was investigated at pH 1.2 and 7.4. Aqueous solubility was determined using UV-spectroscopy. The in vivo activity was determined using hypernociception induced by carrageenan and capsaicininduced nociception models. Results: Among the synthesized compounds, LASSBio-1495(6b) stood out displaying antihipernociceptive and antinociceptive activities by oral administration; it inhibited pp38 expression in PMA - differentiated THP-1 cells and TNFα production induced by LPS; inhibited p38α activity, albeit in low potency (IC50 = 60 ± 4.5 µM); and showed better solubility and metabolic stability than the original prototype LASSBio-998. Conclusion: The simplified urea derivatives 6a-d showed improvement in their solubility and stability profile, displayed potent anti-TNFα activity through mechanism that is probably independent of p38α inhibition, and exhibited antihypernociceptive and antinociceptive effects by oral administration. p38 MAPK, metabolic stability, urea derivatives, antihipernociceptive activity, antinociceptive activity, THP-1 cells.